Back in the 1990s spelt kernels had to be purchased in bulk and you'd use a small kitchen grinder to make flour. But today, spelt flour can be purchased at most grocery stores. You'll find it in the natural foods or baking section of the store. Food products made with spelt are also more common and include crackers, cookies, pasta and other snacks and foods. Most of the calories in spelt flour come from carbohydrate. There are about 120 calories in a single serving (one quarter cup). You'll get 22 grams of carbohydrate in that serving size. The carbohydrate in spelt flour comes in the form of fiber (4 grams) and starch. There are no naturally occurring or added sugars in spelt flour. The glycemic index of spelt flour is estimated to be 55-67, according to the The Diabetes Council. Studies have shown that bread made with spelt flour has a similar glycemic index to bread made with white flour. There is almost no fat in spelt flour. A single serving provides just one gram of fat. Spelt flour is not a high protein food, but a single serving does boost your protein intake slightly. You'll benefit from four grams if you consume a single serving. Spelt is an excellent source of calcium, magnesium, selenium, zinc, iron, and manganese. It has vitamin E and B-complex vitamins (especially niacin). All in all, spelt is an excellent healthy whole grain. Eating spelt and spelt products is an excellent way to get more whole grain fiber into your diet. Fiber is essential for a healthy digestive system and eating a fiber-rich meal can slow down the absorption of sugars. And it can help you feel full longer, so it may be helpful when eaten as part of a weight loss diet. A whole-grain diet has also been linked to better cardiovascular health and a Danish study done in 2016 found that people who ate more whole grains had a lower risk of heart attacks. But how does spelt compare to whole wheat nutritionally? They're actually quite similar. Spelt grains and flour contain a little more protein than regular wheat, and there's a little difference in the amounts of some of the minerals, and they have about the same amount of fiber. Where does spelt flour come from? The official name of is Triticum aestivum var. spelta. It was originally grown in Iran around 5000 to 6000 B.C. Spelt has been grown in Europe for over 300 years, and now in North America for just over 100 years. It's been used most commonly as a feed grain for animals, but, it's gained popularity as a shop grain due to its nutty flavor and nutrition content. Can spelt flour be used in a gluten-free diet? No, spelt shouldn't be consumed by people who can't have glutens.. Even though the gluten isn't exactly the same as wheat gluten, it's still not suitable for a gluten-free diet and people with celiac disease must avoid spelt. Some people who claim to have wheat sensitivities believe they can eat spelt in place of wheat. But it's not going to work for people who have celiac disease or non-celiac gluten sensitivity. If you're sensitive to wheat or other gluten grains, you should speak with your health care provider before eating spelt. Like wheat, barley and rye, spelt is a gluten grain. Gluten is the protein that gives bread and other baked goods their texture. Since it has gluten, spelt flour can replace whole wheat or whole grain flour in most bread recipes. It's not identical though. The gluten in spelt isn't as strong as wheat gluten and many bakers find that when making bread with spelt flour, the dough doesn't always rise as high and sometimes it falls while it's baking. It helps to add a bit of vital wheat gluten to bread dough made with spelt flour. For other types of baking, spelt flour works just fine as it is. You can use spelt flour for baking cookies, spelt bread, and banana bread, and it works just fine as a thickener for sauces and gravy. Whole spelt grains can be cooked and eaten as a side dish or as a cereal. Combine three cups of water with one cup of spelt grains plus a bit of salt and pepper and simmer until the berries are soft. It's also delicious when topped with berries and a bit of honey for breakfast. 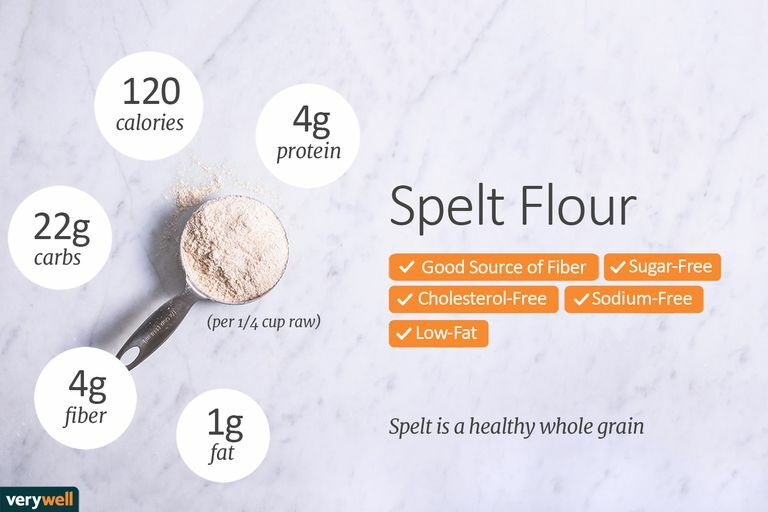 According to the American Academy of Asthma, Allergy and Immunology, it is possible to have an allergy to spelt flour. If you generally avoid wheat (or other gluten-containing products) you may or may not have a reaction to spelt since it is related but not exactly the same as wheat. Symptoms of celiac or gluten sensitivity may include bloating, gas, diarrhea, and other digestive problems. Helnæs A, Kyrø C, Andersen I, Lacoppidan S, Overvad K, Christensen J, Tjønneland A, Olsen A. "Intake of whole grains is associated with lower risk of myocardial infarction: the Danish Diet, Cancer and Health Cohort." Am J Clin Nutr. 2016 Apr;103(4):999-1007. doi: 10.3945/ajcn.115.124271. Oplinger ES, Oelke EA, Kaminski AR, Kelling KA, Doll JD, Durgan BR, Schuler RT. "Spelt." Alternative Field Crops Manual. University of Minnesota, University of Wisconsin. Updated January 2000. United States Department of Agriculture Agricultural Research Service National Nutrient Database for Standard Reference Release 28. "Nutrient data for 20141, Spelt, cooked."